You are hereWhat are the best marijuana strains for beginners? What are the best marijuana strains for beginners? Would you like to find the perfect strain for your symptoms? If so, you're going to love this article which reveals everything you need to know to make the right choice. Now before I get started, I know many of you will be asking me where you can get seeds for these strains. If you know someone who is already growing any of these strains, it's easy. Just ask them for seeds or clones. Indica, Sativa, Ruderalis, Oh My! According to wikipedia, "Cannabis sativa is an annual herbaceous plant in the Cannabaceae family." Sidenote: All "strains" of marijuana, including hemp, are sometimes technically still considered varieties of the plant "Cannabis Sativa." Scientifically, these are not different "strains" of marijuana as much as they are "varieties" of the plant Cannabis Sativa. This is confusing sometimes, because people will talk about "Sativa" varieties of Cannabis Sativa as well as "Indica" varieties of Cannabis Sativa. This isn't important to the grower, but sometimes you'll run into someone who argues about the proper language, and understanding the distinction between what science says and what growers say will help you. In the common language, we have differentiated the different varieties or "strains" of marijuana because each one grows differently, contains different cannabinoid profiles, and has different effects on people. These facts are what's most important to the grower. The Indica variety of marijuana tends to grow short and bushy, with wide/fat leaves. The buds produced by Indica plants tend to cause a more heavy and relaxing effect, known as a "body high", and can cause people to feel "couchlocked." Indica plants tend to be well-suited to grow indoors because of their shape and Indica buds are especially suited to relieve insomnia, muscle tension, nausea, lack of appetite, anxiety, body pain, and depression. The Sativa variety of marijuana tends to grow tall and lanky, with thin, fingerlike leaves. Sativas also generally have a longer flowering period and grow buds that are more airy and less dense than from an Indica. The buds from a Sativa plant cause more of an "in your head" high, sometimes psychedelic, sparking creativity, uplifting your mood, and even can be energizing for some people. Sativa varieties of marijuana are often better suited to growing outdoors as they can grow to 20 feet or more in height. While an indoor grower can use growth control methods to control the height and shape of the plant, a full Sativa can be tough for an indoor grower with limited space. Therefore, many indoor growers who love the Sativa effects will opt for a hybrid that carries the same bud properties, but has been bred to be easier for indoor growing. Well-loved by artists, Sativas are especially suited to relieve depression, migraines and certain types of pain, while being more "day-friendly" and energizing than many pure Indicas. The Haze variety of marijuana is often considered a type of Sativa, or at least Sativa-dominant, yet Hazes have a few unique properties all their own. The genetics of this strain are a combination of Sativas originally from Mexico, Colombia, Thailand and India. Hazes tend to have psychedelic and uplifting effects, and Haze plants have contributed genetics to many famous strains such as Super Lemon Haze, Northern Lights, and Jack Herer. Hazes tend to have very long flowering periods, though stay shorter and are easier to grow indoors than a pure Sativa. 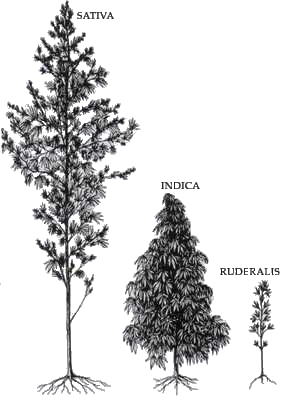 The Ruderalis variety of marijuana that was once known as 'ditchweed.' With no psychoactive properties on its own, pure Ruderalis plants have been mixed with other strains because of one unique property... Unlike most strains of marijuana, Ruderalis or Auto-Flowering strains will naturally go into flowering on their own, without the need for the 12-12 light change to let the plant "know" it's time to start flowering. Basically, a Ruderalis plant will go through its whole lifecycle in about 3 months, regardless of what you do as a grower. This can be bad if you'd like to harvest big yields, but can be convenient since Ruderalis plants tend to stay very short and are well-suited to small, indoor spaces. A Hybrid is any combination of the cannabis varieties listed above. Hybrids make up the majority of all the strains you will encounter or be able to buy today. Ruderalis strains used to tend to be less "potent" (with THC) compared to other strains of marijuana, since original Ruderalis plants had basically zero THC. In recent times, many strains have been developed that have nearly comparable THC levels, which maintaining the auto-flowering characteristics of Ruderalis. Another unique property of Ruderalis strains is, like hemp, these strains sometimes tend to have higher levels of CBD which have many implications for medical uses such as anti-anxiety. Where can I order seeds? The tips and advice in this article are only meant to be used by those who can legally grow marijuana according to all applicable laws. We do not in any way recommend that you use this information if it is not legal for you to do so. Please do not proceed to read any of the following information if you are committing a crime by following the steps outlined in this article, even when growing for pain relief, medical research, or any other reasonable purpose. Now I love experimenting as much as the next person, and even after 8 years of growing marijuana, I still occasionally grow "found" seeds. But even though I've grown found seeds from the dankest of dank buds, I've still always had the best results when growing from specific strains that I already know something about beforehand. Often the effects of random seeds are wildly different from the "parent" you found them in. Either that or you don't know what growing conditions are needed to produce the effects you desire. Because of this added random factor, I highly recommend choosing a strain that fits your specific needs, especially if you're looking for seeds with certain effects (for example to treat a certain symptom like pain, nausea, or anxiety). Another good reason to choose a specific strain is if you are looking for compatible growing patterns, for example you can choose to grow strains that are especially quick-to-harvest or particularly easy to grow. Note: "Feminized" seeds means that the seeds have been particularly bred to product all-female plants. Regular seeds will end up being about half male and half female. Female plants produce buds, while male plants are usually thrown away. Sometimes confused with Ak-47, Ak-48 emerges victorious from this battle between similarly named strains for being easier to grow, and for providing an incredibly social high. Effects: Though this strain is a hybrid, the effects tend to be more like a sativa. Relieves stress and anxiety for many people, though does have higher reports of dry mouth. More uplifting and energizing than many strains. Growing Conditions: Grows great indoors or outdoors, in soil or hydro. Reacts well to growth control methods like being topped and has resistance to root problems. However, does not like high temps and doesn't do well above 85 °F (30 °C) . Strong, pleasant sweet odor starts ramping up towards end of flowering stage as harvest time approaches. Nebula's Thoughts: My favorite strain for going out. You really can't ask for more from a strain, Ak-48 is potent and remarkably easy to grow. Buds taste great and smell slightly sweet, spicy or fruity. An anonymous reviewer described this strain best: "I feel like I could work out... but I'm definitely sufficiently baked. Like, severely baked." Effects: Euphoric, a great "enhancer" for other activities, and often used to relax or relieve stress. Does cause higher levels of dry mouth compared to other strains. Growing Conditions: Hardy, tends to stay short and quick to harvest (usually ready to harvest after only 2 months of flowering). Dense buds don't usually give off a strong odor and the plant reacts well to low stress training and other growth control techniques. These traits makes this strain especially suited to indoor and/or stealth growing, though many have reported great results growing outdoors. Yields: Average to Above Average. Considering that plants tend to stay short, she grows above average yields. Nebula's Thoughts: Easy to grow, potent, and quick finishing, though not known particularly for flavor (she's not quite odorless). I often recommend this strain for people's first grow, as Northern Lights plants stay short, don't smell a lot, and are especially forgiving. Effects: "Stoney," couchlock, ultra potent indica. Great for treating nausea. High THC levels, tested at 19.7% from last batch. Growing Conditions: First generation hybrids often tend to be tough and resistant to problems, and Aurora Indica is no exception. Easy to train, she can handle higher temperatures and still thrive. Stays on the short side, though there are some reports that occasionally a seed of this strain grows more tall and leggy, like a sativa, and needs to be trained stay short (though the buds produced are still amazing). Quick 7-9 week flowering period then she's ready for harvest. Heavy odor, especially as harvest approaches. Yields: Big yields with fat colas. Nebula's Thoughts: Currently one of my favorite strains. Easy to grow & train, high-yielding and POTENT. Anonymous said it best with, "Remember to wear ear plugs so your brains don't leak out." Jack Herer and Jock Horror are two similarly named strains with similar genetics and effects. However, Jack Herer is the original, and almost everyone agrees that it's better. Effects: Euphoric, uplifting and creative. The effects of the buds are somewhat like a haze strain. Relieves stress or anxiety, but also used to provide relief for pain, headaches and muscle spasms. Growing Conditions: Medium to tall height, she'll double in height or more after she begins the flowering stage unless you use growth control methods to keep her short. Despite the haze genetics, this strain actually finishes relatively quickly, I've had best results harvesting 2.5 months into flowering. Buds tend to grow with "foxtails" which give the buds a unique appearance. Does best indoors, though can be grown outdoors in a sunny, mediterranean climate over a long summer. She's not super picky, but she does need for you to pay close attention to her needs, and cannot stand too-hot temperatures. Nebula's Thoughts: Jack Herer has probably won more awards than any other strain. The buds literally strike down on anxiety like a hammer, so you can just get on with your life. Clean, refreshing high and unique spicy, almost peppery taste/smell. Not the easiest to grow, yet the buds are incredible and totally worth a little extra trouble for the marijuana connoisseur. Sensi seeds said it best with "Smokers should be prepared to feel the earth shake beneath their feet - which can be a very pleasant feeling when your head is firmly in the clouds." Effects: Surprisingly strong, energetic and creative, perfect for daytime use. Doesn't usually cause 'couchlock'. You may want to avoid this strain if you've experienced anxiety or paranoia in the past, as the effects come on fast and hit you like a ton of bricks. Tends to cause dry eyes/dry mouth. Growing Conditions: Needs 2.5-3.5 months in the flowering stage, and can get tall, growing in a Christmas tree shape, unless you top or FIM her (she responds well to growth control methods). Nebula's Thoughts: 2008 High Times Cannabis Cup winner (by a landslide). I have a soft spot for hazes and this one tastes like a lemonhead. The effects are strong yet clear-headed. I often choose this strain when I'm working or have a lot to get done. It doesn't weigh you down yet makes everything seem just a little bit more awesome. According to Greenhouse Seeds, "The THC is high at over 22%, ensuring a very psychedelic experience to even the most experienced smokers." Since then, Nebula has published dozens of growing articles in print and online, stars in several online video lessons, and continues to dedicate herself to serving the needs of the medical marijuana growing community. "My mission is to show other medical marijuana patients how easy and fun it can be to grow pounds of killer weed out of your closet." At GrowWeedEasy.com, we recently decided to re-evaluate all the top cannabis seed banks based on customer service, reliability, and longevity. We came to the conclusion that there are 3 clear winners as far as who to get seeds from. These seedbanks have legendary customer service, and will gladly answer all your questions about your seed orders. If you ever have a problem with any order, I highly recommend contacting the seedbank right away as they will quickly take care of you. Buy seeds directly from the breeder. Reliable, Fast Shipping, Customer Reviews about each strain. Nirvana has been breeding award-winning strains for over 3 decades. This is where we go for seeds! This source offers seeds from many different breeders, and has unique sales and specials if you keep checking back! A reputable company that acts as a seed bank for different breeders - great stealth shipping that shows up to your doorstep quickly - offers a huge selection including most big name strains.